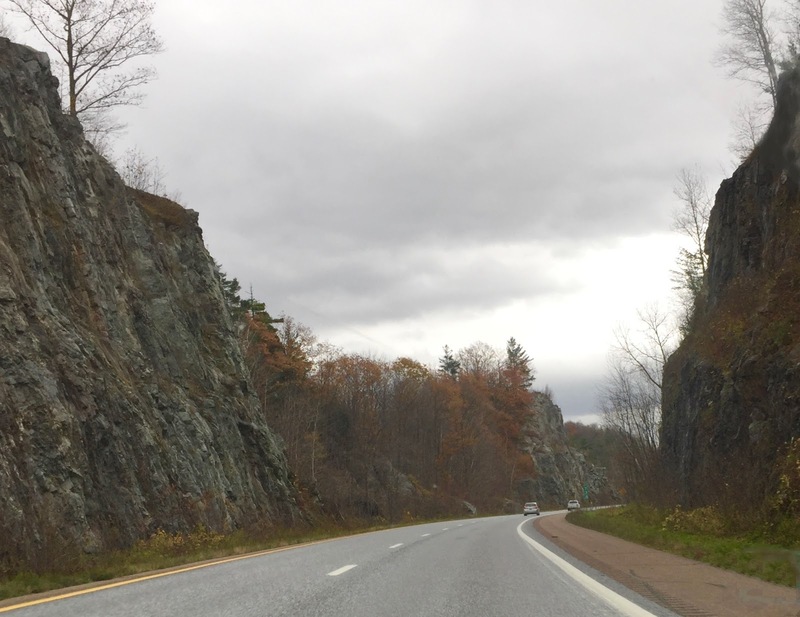 This is a picture that I took as we were driving home from Vermont on a cold, wet afternoon. The location is somewhere between Burlington and Montpellier. Although I took a lot of photos in Vermont, I was often taking pictures from the driver's seat of a moving car. It was pretty challenging to get an image I could use, especially with a lot of cars on the road. There were only two cars in the distance in this photo, so I thought it might work. But I had to do a lot to get there. I opened the original photo in Painter and cropped out the dashboard and car interior. When I had the composition I wanted, a corner of the inspection tag on the windshield was still visible in the lower right part of the image, so I used some cut and past and digital pastel to fix that. I also had to even out the color in the upper left corner because you could see the outline of the windshield. Once I got that far, I also created two more versions in Painter, one with a posterized effect, and the other with a woodcut effect. I plan to post them here over the next few days.